I think it was Andrew’s idea to do Mother’s Day tribute strips. He’s a sweetheart that way. 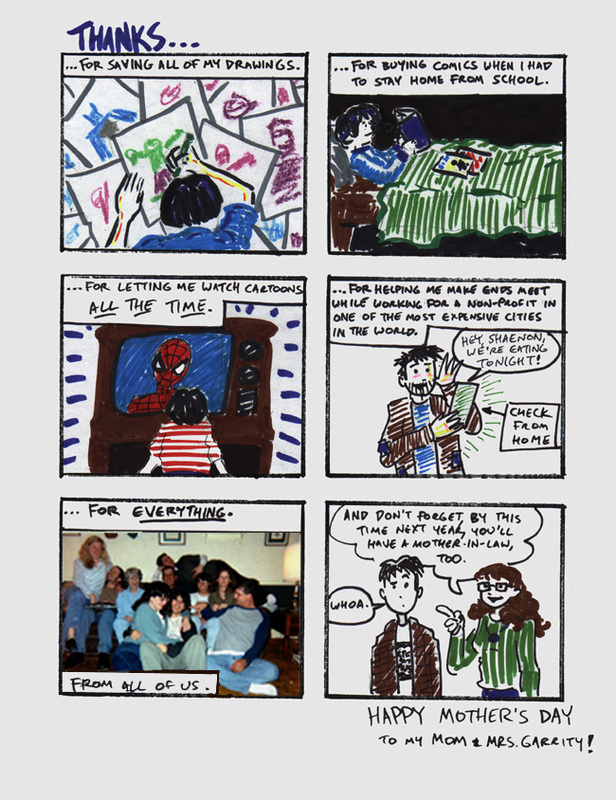 The drawing of me in panel two looks a lot like the gawky young Helen in the upcoming storyline “Dave Davenport Has Come Unstuck in Time.” This is what I looked like in elementary school, purple plastic glasses and all. I wore that T-shirt with the pink hearts on it all the time, generally with stirrup pants and jelly shoes. The book I’m holding is a cartoon guide to copyright law I wrote in fourth grade. I was really into copyright law then. I was not a popular kid, no. Panel three is exactly the way I looked in high school, and if I’d included teenage Helen in “Unstuck in Time,” as was my original plan, she would have looked just like this only blonde. The framed artwork is a big pencil drawing of elephants I did in high school art class. I’m still kind of touched that my parents had it framed. They had such high hopes for me, the poor things. Fortunately, my younger brother got an awesome job in television and can support them in their old age. No drawing of my mother would be complete without a glass of wine. The star-themed clothing is optional, but recommended. Yep, I’ve got a mother-in-law now, and it’s not nearly as weird as I seemed to think it would be in that last panel. I get a few extra presents on my birthday and Christmas, there’s an extra source for home-cooked meals when I’m in the midwest, and I’ve got one more person who checks in periodically to make sure I’m eating right and not working too hard. Pretty good deal, really. I’m still very thankful for all the things my mom did for me (and let me do) when I was growing up, and I wouldn’t be where I am today without her. It’s been quite a few years since I’ve had to ask for substantial checks from home, by the way, so I must be doing something right. 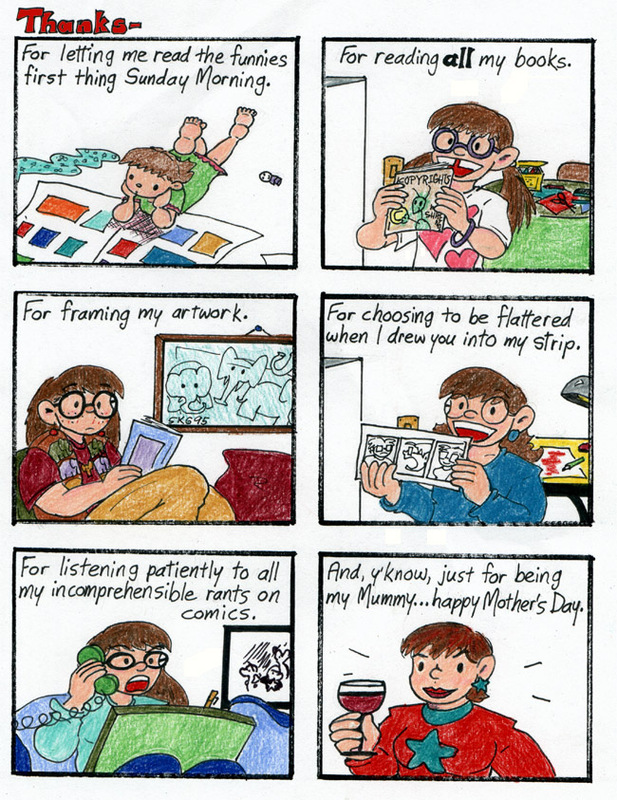 It’s a bit weird to be commenting on a Mother’s Day comic in October, but fortunately this is running right around my mom’s birthday (and I’m typing this just after my mother-in-law’s birthday), so it’s strangely appropriate, anyway. Is over … over … over!